Review : If you say vanilla, you have just said my name. You see, I reall do love vanilla. Vanilla yogurt. Vanilla ice cream. And the list goes on and on and on. Yeah, I have no life...so what. And so during my last order through Dragonwater Tea Company (now out of business) I came across their Earl Grey de la Creme Black Tea, which has vanilla in it. And so like a well trained pavlov dog, I felt absolutely compelled to order this tea and give it a try. 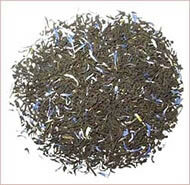 Here is how Dragonwater Tea Company (now out of business) describes this tea on their website : "Earl Grey de la Creme Tea. A sturdy blend of Assam, Ceylon, and Nilgiri teas flavored with a high quality oil of bergamot and just a hint of vanilla and cream." Did someone say cream? Did someone say vanilla? Hmmm....talk about a lead-in to get a vanilla junkies hopes up. I love vanilla. I love cream. After all, what is ice cream but vanilla and cream? And I love ice cream! So after reading what was in this tea, I really felt my hopes lift to new levels. Unfortunately, the taste of this tea just didn't match my expectations. Of course, this isn't really the teas fault here. Really, to be honest, this tea tasted exactly like how it was described. The problems is that I'm still continuing my never-ending and so far fruitless search for that tea that is a true "replacement" for vanilla ice cream. For better or for worse, when I think "vanilla", I think "vanilla ice cream." And I was really hoping that this tea, which also contained cream flavoring, might indeed be the savior to my lustful vanilla desires. But it was not to be. Don't get me wrong. This tea was fine. Not my favorite, to be honest. But the tea did have both a pleasant taste and fragrane to it. There was no bitterness, either. Yet, the vanilla flavor in this tea, which is quite strong...just wasn't what I wanted! It tasted in no way like vanilla ice cream. And perhaps worse, this tea really didn't taste like a earl grey tea either...another disappointment since I do like earl grey teas, especially scented ones. I got desperate towards the end. So I added milk. And the tea tasted darn awful once I did that...either I added to much or my taste buds revolted against the mixed tastes of this tea and milk. Overall, this is a good tea. I just think this tea and myself are not meant to get along, for better or for worse. And really, it is my fault here...I was expecting something from this tea that I'm beginning to recognize I'm never going to find...a vanilla ice cream flavored tea! Recommendation : Yes. This tea, despite its vanilla and cream flavorings, is no replacement for vanilla ice cream, as I rudely discovered. Additionally, it tastes somewhat different in comparison to other earl grey teas, especially scented earl grey teas which I especially like. Yet, this tea was still good. The black tea taste wasn't overpowering, the vanilla taste was very strong and there was indeed a hint of cream flavorings. So if you don't have as finicky taste buds as I myself do, and keep your vanilla ice cream replacement expectations in check, I suspect the odds are good you will enjoy this tea.